Being billed as the most affordable Nokia Lumia smartphone thus far, Nokia has now gone official and announced the new Nokia Lumia 510, which is an entry level Windows Phone at an affordable price point and will be available to purchase in five vibrant colours, black, white, cyan, yellow and red. 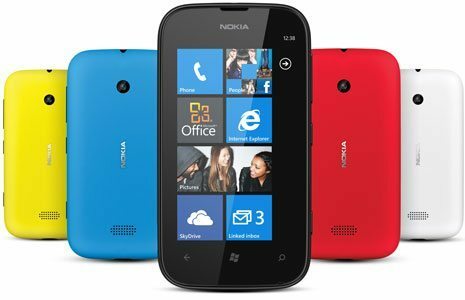 According to Nokia Conversations, unlike numerous handsets at the affordable price point, the Nokia Lumia 510 offers a 4-inch WVGA TFT touch screen with 800 x 480 resolution, whilst on the rear of the handset sits a 5 megapixel auto-focus camera that does VGA video at 30fps. The Nokia Lumia 510 also sports a Snapdragon S1 processor, 256MB RAM, 4GB internal memory, Bluetooth 2.1 + EDR, WiFi 802.11b/g/n, WCDMA connectivity, and runs Windows Phone 7.5 Mango, so isn’t a Windows phone with cutting edge technology. With the Nokia Lumia 510 you do get Windows Phone Live Tiles that enables you to check out at a glance updates along with fast access to your apps and social networks and stuff, and you also receive 7GB of free online storage to Microsoft SkyDrive so you can store all your pictures and stuff, and the smartphone measures 120 x 64.9 x 11.5mm with a weight of 129 grams and has a 1300mAh battery. There is of course instant access to Nokia Maps navigation, Nokia Drive and Transport with the Nokia Lumia 510, and as for the price point for the Windows Phone, the Nokia Lumia 510 will command a price tag of roughly US$199, and will becomes available to purchase as of next month in India, South America, Asia and China. For those that might be interested in the new Nokia Lumia 510 we have a video of the smartphone in action for your viewing pleasure below, so don’t forget to mash that play button and check it out. Any of our readers tempted by the Nokia Lumia 510?